Tierrasanta who describes itself as the Island in the Hills is a unique residential community if for no other reason that it is the only residential community in San Diego where all of roads leading into Tierrasanta dead end. Thus, there are no roads that just pass through it going somewhere else. Yet, it’s hill top location offers it’s residents great access to highway 52 and the 805 Freeway. it’s also just minutes to Kearney Mesa and Mission Valley. 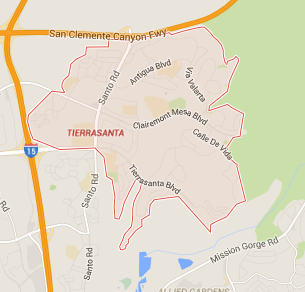 Tierrasanta has been almost fully built out since the early 1990s, and has a population of 30,443 (ZIP code 92124). Many of the 2,300 homes are grouped in the southwest portion of the community and are part of the Murphy Canyon military housing complex. 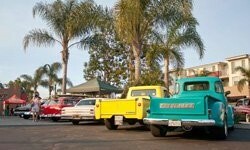 It was alsoone of the first master planned communities in San Diego. Tierrasanta was originally part of the Mission San Diego de Alcalá ranch, which was active during the late 18th and 19th centuries. Being home to many military families, military personal have easy access to the freeways . So if you are serving in the military these freeways can get a soldier to the Miramar Airbase in minutes to muster or to a ship stationed at 32nd Street or to a military base in almost no time at all. Thus, literally thousands of military families reside in military housing that comprises a twenty percent of the housing in Tierrasanta. Thus, without though traffic the traffic in Tierrasanta is much less than elsewhere. 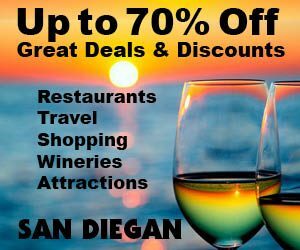 And with very few places to eat and shop residents frequent other nearby areas such as Mission Valley and Kearny Mesa and what to do is centered around the family with only one major grocery store and two tiny shopping malls. Yet there are several large playgrounds and nearby schools. Recreation Center is open daily. Facilities include a gymnasium, meeting and activity rooms, a dance room, children’s play area, picnic facilities, tennis courts and a swimming pool. The community also has a branch library, jogging/biking trails, and several baseball and soccer teams. As part of the robust community spirit has resulted in the creation of The Tierra Times, a community service newspaper, has been published since 1971, and is delivered to all residents 13 times per year. Also here is the Friends of Tierrasanta Canyons is a Tierrasanta based volunteer group that maintains the open spaces of the neighborhood’s canyons. They meet the second Saturday of every month in various Tierrasanta open space locations. Tierrasanta, which includes numerous hills and canyons, is situated like an island, not directly bordered by any community. It is bounded on the north by the Mount Soledad (52) Freeway and the sprawling southern fields of MCAS Miramar; on the east by the 5,800-acre (23 km2) Mission Trails Regional Park, which has numerous hiking and mountain biking trails; on the west by bluffs running along the wide Interstate 15 corridor running from Friars Road to Route 52, and on the south by steep canyons overlooking the San Diego River and Mission Valley. Community activities focus on the Tierrasanta Recreation Center, which includes lighted sports fields, a large swimming pool, tennis courts, a gymnasium, and meeting rooms. Numerous green belts with walking paths run through the canyons, and are kept in good condition with the help of the Friends of the Tierrasanta Canyons. There are a number of entrances to Mission Trails Regional Park, including a heavily-used entrance with parking at the western end of Clairemont Mesa Boulevard. The community has tree-lined streets and a secluded “small town” atmosphere, though it is centrally located within a 20 minute drive to downtown San Diego. Tierrasanta is a community of single family homes, condominiums, apartments, three shopping centers, a branch of the San Diego Public Library, and a research park. Also located in the community are several top-ranked elementary and middle schools, which are part of the San Diego Unified School District. Schools include Hancock Elementary School, Kumeyaay Elementary, Miller Elementary, Tierrasanta Elementary, Vista Grande Elementary, Gaspar de Portola Middle School, Jean Farb Middle School and Junipero Serra High School. The community has a branch library, jogging/biking trails, and several baseball and soccer teams. Music falling under the categories of jazz and their instrumental concert band is quite prominent in the community. in addition to the numerous physical sports teams. where they find an aboundance of shopping alternatioves including Mission Valley Center and Fashion Valley as well as there being a Costco on Friars Road in the Fenton Parkway Shopping Complex, which is also home to an Ikea and a Loews. Plus, there are many restaurants to discover. Everybody’s favorite is Studio Diner at 4701 Ruffin Rd. (858-715-6400) featuring great American cuisine for breakfast, lunch and dinner. 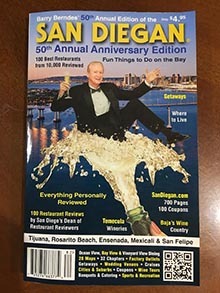 It was also the wineer of the San Diego REstaurant Association’s 2011 Gold Medallion Award for best American Restaurant. Plus, it was featured on Diner’s Dives and Drive-ins. So you know that you have to make this one of your favorites too.And their desserts are no less than spectacular! Convoy Street is home to over 50 Asian Restaurants in a half mile long thoroughfare called Convoy Street. One highly recommended dining destination is Phuong Trang a Vietnamese cuisine Restaurant that has won virtually every award imaginable. The portions are huge and the service is fast and friendly. It’s also popular as a to go spot to grab something good to take home for your family. Highly recommended are the vegetarian wraps, the tamarand soup and the honey glazed chicken wings. Vegetarian dishes abound.